Biotechnology offers many potentials but also dangers. Regulation is clearly essential. But how, over what and with what measures is less clear. The debate about how to regulate emerging technologies associated with biotechnology is a hot one the world over. In India, it's about to become much hotter. In July 2011, the Biotechnology Regulatory Authority of India (BRAI) Bill (pdf link) was presented by the minister of science and technology to parliament. It has been long in the making, building on a series of commissions – on agriculture and health – led by Professors Swaminathan and Mashelkar in 2004 and 2005. The proposals contained in the Bill were the subject of a panel discussion at the recent seminar jointly convened by the Centre for Public Policy at the Indian Institute of Management in Bangalore, the Association for Biotechnology Led Enterprises and the STEPS Centre, and supported by UKIERI. Everyone agrees that biotech regulation in India needs an overhaul. There are too many overlapping responsibilities, unclear mandates and lots of red tape. Regulatory delays result in losses of revenues for businesses, and the lack of transparency and unclear procedures are frustrating for applicants and opponents alike. 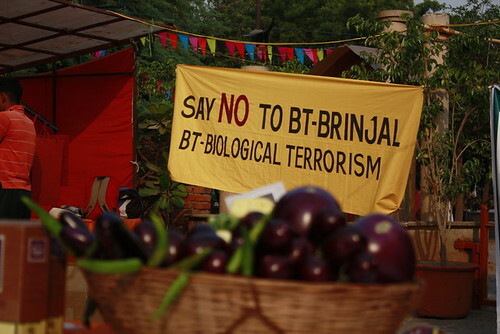 The debacle over Bt brinjal (aubergine/egg plant), which dominated the headlines in 2010, illustrated the limits of the current system, with conflicting scientific reports and mismanagement of the process by the GEAC (Genetic Engineering Approval Committee). An independent authority with a clear mandate and streamlined procedures was supposed to get over the chaos and confusion that has dominated the regulatory scene in the past years. But will the BRAI achieve this? Some argue that self-regulation and industry oversight is all that is needed. A light-touch approval process would speed up innovation, and allow Indian biotech to flourish. Surely, the regulation-sceptics argue, India can make use of regulatory approvals elsewhere in the world, and not get mired in repeat assessments locally. GM crops are often cited as an example. If Americans can eat Bt foods, why not Indians? they argue. Equivalence and harmonisation should characterise an internationalised regulatory system, with simplicity and efficiency as the watchwords. No-one at the seminar argued this way, however (although there are still plenty who do). Instead, seminar presenters argued that regulation is essential. Vijay Chandru (Strand Life Sciences) argued that the “genie is out of the bottle”. Biotechnology is massively powerful, but also potentially hugely dangerous, he said. We are only on the cusp of realising some of its potentials, with sequencing times reducing dramatically and costs halving every five months. The initial sequencing of the human genome cost $2.7bn, while today it can be done for about $1000, he claimed. Before long, what he dubbed “home-brew DIY genomics” will be possible, with DNA printers able to reveal full human gene sequences for a few hundred dollars. “There are obvious dangers”, he observed. Take synthetic biology – new organisms including lethal viruses could be manufactured. “We really need to have a good regulatory process in place”, he noted. “And we need to do it soon, or there will be all kinds of chaos”. So what are the key ingredients of a regulatory system? Efficiency and cutting down on red-tape is important for sure. And so is the sort of expert “domain knowledge”, emphasised by Ravi Kumar (XCyton). Good information, based on solid science, outlining all the uncertainties is essential, he argued. Avoiding what he termed “the agony of local clearance” was a must. A “clean slate” was needed, he said, as “the current system is just not working”. But for regulation to have purchase, and to be regarded as legitimate and authoritative, it must also be trusted. An “all powerful” institution, no matter what its high-sounding aims are at the beginning, will, Ravi Kumar argued, be corrupted in time. Today, he commented, “we suspect every institution and its integrity”. The lack of faith in public regulatory institutions is of course not just an Indian experience. This has happened in Europe and elsewhere. Rebuilding trust is essential. And the global lessons suggest that this requires a solid commitment to public participation and democratic accountability. As the seminar discussed, it is on these issues in particular that the BRAI proposals remain severely lacking. Leo Saldhana (Environment Support Group) presented the results of a comprehensive critique of the Bill he undertook with his colleague, Bhargavi Rao. The critique is damning on a number of fronts. The proposed BRAI is seen to centralise authority; mix sector promotion with regulation, creating a conflict of interest; be democratically unaccountable, failing to recognise the multiple tiers of government; be excessively reliant on narrow technocratic expertise; override other important legislation (including the Right to Information Act); and ignore public concerns, making objection and protest impossible. Their recommendation is that the Bill is potentially unconstitutional and should be rejected. The paper provides the details, but the panel and plenary discussion that ensued concurred that “a major rethink is required”. Vijay Chandru suggested that an alternative “marked up” version of the Bill be produced, and submitted to Parliament. Like so many other attempts to streamline regulation in favour of industry interests in order to promote efficiency and growth, the BRAI Bill appears to fall into the same traps. It assumes that democratic deliberation on alternatives, and the risks and costs of each, represents an inefficient ‘bottle-neck’, rather than a necessary way of creating public legitimacy for regulatory decisions. It sees only one narrow form of expertise as necessary, rather than a more inclusive approach that recognises diverse, plural views, including those of the public. It frames the response in terms of ‘risk’, assuming that probability of outcomes are known and can be managed technocratically through expert decision-making, rather than recognising uncertainty or deeper ignorance as the norm. Under such situations, a precautionary approach is required, which acknowledges we often don’t know what we don’t know - especially when the “genie is out of the bottle”. It creates unaccountable governance arrangements that actively exclude public participation, which is seen as a time-wasting diversion from the important priorities of growth and economic progress. But in a vibrantly democratic country like India, avoiding public debate, as the experience of the past decade has shown, is not an option. Inclusion, participation, accountability and democracy must be central to any regulatory system. Many at the seminar agreed that a top-down, elitist, technocratic, expert led system will not, in the end, serve industry or the public well. "...it is my duty to adopt a cautious, precautionary principle-based approach and impose a moratorium on the release of Bt-brinjal, till such time independent scientific studies establish, to the satisfaction of both the public and professionals, the safety of the product from the point of view of its long-term impact.... "
Here two important moves are made by the Minister. He argues for a precautionary approach, accepting uncertainty, and he argues that publics must be involved in assessing the evidence. Both these principles are essential for any regulation of any technology where risks are real but also uncertain. It appears that the BRAI Bill has not taken on board these lessons, but it would be wise to do so. It is to be hoped that the democratic deliberations in the Indian parliament, as well as any of the legal challenges which will undoubtedly follow, will help to create the appropriate revisions to make a more effective, democratic and accountable regulatory system for Indian biotechnology. For up to date posts, visit the blog on the STEPS Centre website. The STEPS Centre (Social, Technological and Environmental Pathways to Sustainability) is an interdisciplinary global research and policy engagement hub combining development with science and technology studies. We aim to develop a new appraoch to understanding, action and communication on sustainability and development. Our work covers agriculture and food, health and disease and water and sanitation. Based at the Institute of Development Studies and SPRU (Science and Technology Policy Research) in the UK, with a network of partners in Asia, Africa and Latin America, we are funded by the Economic & Social Research Council. Crossing: a place at which pathways or tracks intersect; a path which can be crossed to get from one side to the other. We want to generate and encourage debate about pathways to sustainability through our research. The Crossing is a place where that debate can happen. Please join in.